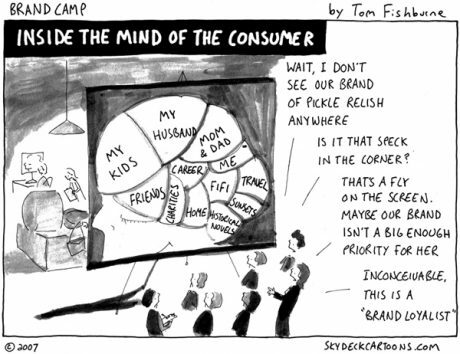 How much do people think of your brand? Comic via Marketoonist. As it is ‘unexpected’ by the recipient, the first thing the email needs to answer is ‘who is this from?’. These days, some brands try to move away from a branded sender name, and using a personal name of one of their employees. I recently almost unsubscribed from a Marketo email (which was otherwise recognizable as such, but only after opening!) because it came from a guy named Colm O’Dwyer. Never heard of him in my life, but I had signed up for Marketo emails. I’m sure somewhere in a test, such personal sender name usage for a branded email has showed success. However, there’s the danger of quite the opposite: failure of an email campaign or even higher unsubscribes / spam complaints. The ‘junk’ button is only one click away, after all. The same goes for the from / reply-to email address. Don’t send me emals from jimmyjam @ somecompany.com, or other personal names at a company I do not know. Send me emails from contact @ somecompany.com, or getintouch @ somecompany.com, or hello @ somecompany.com (Litmus uses that last one btw). Why do that? Because there are quite a few important reasons. First of all, when I signed up, I probably received a confirmation or welcome email. That email included a basic ‘this is who we are’ part, with often still the request to add the sender email address to the address book, or whitelist it. This way, the emails with that from: email address will always arrive in the inbox. Yaay deliverability! Another reason is the fact that in email marketing, such an email address will be used for inquiries, out-of-office emails, and many other things. You are communicating through that email address to your audience: expect response. If that is a personal email address, managing all that response properly can be daunting. There is an exception to the above: if I already know the actual person in the sender name (either as a prospect or client), it’s less of a bad thing. But still include the company: a sender name like John Doe – Acme Corp. is fine. Still not great to use for automated messages, but that’s debatable, of course. Some brands can get carried away with minimizing their logo use, or leave it out altogether, or whatnot. Now if you are Nike, you could suffice with the use of the swoosh symbol. Or if you are Coca-Cola, with the famous bottle shape. But my guess is your company is not Nike or Coca-Cola, so it needs every pixel of recognizability and brand awareness it can. Logos work. Logos help. Logos are brand awareness whether you like it or not, especially more in email marketing now than before. Here’s why: in the mostly-desktop email days, Outlook is the de facto standard email client. Many users of Outlook have images download turned off by default: however, with the rise of mobile email clients (especially for iOS), more and more often images are downloaded when opening the email. What is expected from me as action? Smart peeps among you may notice I’ve left out the ‘who is this from?’ – this is decided by the recipient based on the sender name and from: email address. Even so, the logo will help in brand recognition and being ‘top-of-mind’. Remember: a single message is nothing, you need many touch points as a marketer to have people think about your brand when considering products or services. If your logo is associated with the right considerations, then you’ll be fine. So don’t go all out with logo-use or non logo-use. Use it wisely and include your brand tag line or slogan if possible (or save it for the pre-header text). Two birds with one stone! The above about the logo counts for color usage as well. Links, titles, header text and such: make sure they follow the brand style guide. It makes for a more consistent experience for the recipient, more brand recognition and shows that you care about your own brand image. If your main colors in an email are different from those used on your website, then why should a recipient care about you if you don’t care yourself? A high quality email campaign shows the care that has gone into it, right up to the little details. Logos and color usage are all-important for that brand awareness in email marketing, every time. Because the best email marketing you’ll ever do is helping people. If people have opened and have read your email, they’ve come that far. However, if the content and CTA is not compelling enough, if they find the footer helpful, at least there’s a positive association with the message in the end. And that’s what it’s all about: have your brand be recognizable in all parts of an email, so there’s no doubt for the recipient about who the email is from. Another task to take off the checklist!